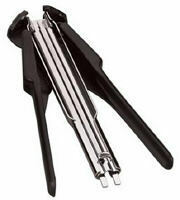 Spring-loaded hog ring pliers are made of heavy-duty stainless steel with non-slip grips. They're handy for quick work in a slippery environment. They work on most smaller size hog rings.